With beach landings, 25 naval ships and an air assault, the United States and eight other countries are staging a major amphibious exercise on the US East Coast this week, fighting a fictional enemy that bears more than a passing resemblance to Iran. After a decade dominated by ground wars against insurgents in Iraq and Afghanistan, the drill dubbed Bold Alligator is “the largest amphibious exercise conducted by the fleet in the last 10 years,” said Admiral John Harvey, head of US Fleet Forces Command. An American aircraft carrier, amphibious assault ships including France’s Mistral, Canadian mine sweepers and dozens of aircraft have been deployed for the drill, which began on January 30 and runs through mid-February. Monday was “D-day” for Bold Alligator, with US Marines stepping on to the beach from hovercraft, near the Camp Lejeune base in North Carolina. With defense spending coming under pressure after years of unlimited growth, the Marines — which devoted a brigade to the exercise — also are anxious to protect funding for their traditional role as an amphibious force. The exercise scenario takes place in a mythical region known as “Treasure Coast,” with a country called Garnet, a theocracy, invading its neighbor to the north, Amberland, which calls for international help to repel the attack. Garnet has mined several harbors and deployed anti-ship missiles along the coast. The threat of mines, anti-ship missiles and small boats in coastal waters conjure up Iran’s naval forces, but the commanders overseeing the drill, Admiral Harvey and Marine Lieutenant General Dennis Hejlik, say the scenario is not based on any particular country. Good grief. Just to be clear for the thousandth time on the future of the U.S. Marine Corps, the Marines aren’t going to conduct a large scale, sea-based, amphibious assault and forcible entry to Iran. It would be ridiculous to believe so. In fact, the Marines aren’t going to conduct a large scale, sea-based amphibious assault and forcible entry anywhere else, ever. Marine Corps strategic thinking that prepares them for such an exigency is geriatric. All the while, SOCOM is planning to park themselves in the Persian Gulf region using a Marine Corps amphibious assault dock, to conduct anti-piracy operations, air-based forcible entry and other missions and operations, conduct hostage rescue, and other assignments as the President decides. Thus they have taken up the mantle of the Marine Corps and the Marine Corps is in the process of signing, sealing and delivering its irrelevancy to the twenty first century. Apparently the Marine Corps doesn’t care any more. For more than a decade now we have been engaged in what we have called a global war on terror, which is an awful name for it since we cannot war against a tactic. We have actually been engaged in a war with militant Islam, but since we don’t want to speak truth, we make up slogans that hide the truth. Congress voted in both Operation Enduring Freedom and Operation Iraqi Freedom to give the President the authority to use force to effect our desired ends in those campaigns. Call it what you will, these were declarations of war, albeit against a country in one case, and against a transnational religious insurgency in another case. Actually, since Salafists of various stripes and other Islamic religious fanatics crossed the Jordanian and Syrian border to fight the U.S. in Iraq, at some 80 – 100 per month at the height of it, we have fought a transnational religious insurgency in both Iraq and Afghanistan. In both cases the use of force was authorized by Congress. But in any case, I have repeatedly called on the reader to study the first chapter of Robert Kaplan’s book Imperial Grunts, the chapter being entitled “Injun Country.” It might disavow the reader of the notion that America was conceived or raised in military isolationism. Nothing could be further from the truth. I have also pointed out that from the very inception of the U.S. Marine Corps, before the effective date of the declaration of independence, the continental congress knew exactly what they were doing. The model they followed was the British Marines, and the British Marines functioned as an imperial force. This design was intentional from the beginning, whether the colonists (or readers today) knew it or not. Daniel Trombly writing at Slouching Towards Columbia, does an outstanding job of filling in the details for us. His post will be repeated at length. The Constitution is not explicit that any kind of warfare must be validated by a Congressional declaration of war. Madison was quite clear that in a case where the United States was defending itself from attack, no declaration of war was necessary. This has been a decision constantly reaffirmed throughout American history, and the debates surrounding the drafting of that portion of the Constitution clearly reveal that the founders saw a distinction between declaring and making war, and explicitly did not require a Congressional declaration for America to make war, only to begin one where no hostile act had initiated it. In other words, beyond continued Congressional approval for whatever financing of the war effort is necessary, there is no requirement for a formal declaration of war for the United States to prosecute one should the war occur in reaction to the commencement of war by a hostile force. The notion that drones are responsible for the “short-circuiting” of America’s process for going to war is illusory – particularly when the idealized version of warfare Singer describes was never the historical norm for the United States. Very few American wars have been fought with a formal declaration of war, including two of America’s earliest overseas conflicts. Indeed, America’s flirtation with undeclared wars with broad Congressional mandates is obvious from the very historical existence of the phrase “Quasi-War,” describing US hostilities with France under the Adams administration. There, the US found it sufficient to pass a Congressional measure authorizing naval action against French ships. Lest anyone chalk this up to a mere outlying tendency in US politics, Adams’s political foe, Jefferson, continued and indeed expanded the trend significantly under his own administration. Thomas Jefferson was eager to prosecute a war against the Barbary pirates, which had amorphous links to recognized political authorities. Yet Jefferson did not seek and Congress did not require a formal declaration of war against an enemy considered to be both hostis humani generis (hostile to all mankind, as most seafaring nations considered pirates) and engaged already in persistent hostilities against American civilian vessels. Congress passed a relatively broad mandate for military force, and Thomas Jefferson’s military proceeded to wage an undeclared war with amorphous boundaries against Islamic unconventional actors, along with the help of private mercenary armies. One can make arguments about why America should not prosecute undeclared wars, fight non-state actors alone, or use privately contracted military forces, but any appeal to the founding fathers is unconvincing at best and a cynical ploy at worst. To blame drones for the trend of undeclared wars that has existed since America’s earliest years is grossly historically inaccurate. Not only does it completely fail to explain America’s participation in the Quasi-War, Barbary Wars, Indian Wars, and the several formally undeclared wars of the 20th century after World War II, it also fails to explain the conflicts which the United States has begun since drones existed. It is quite difficult to say there are any ongoing military campaigns which began or persist solely because of “risk free” drones. The broad authorization for use of military force which began the War on Terror and its “undeclared” nature has very little to do with drone technology, and more to do with the fact that the United States has never formally declared war on a non-state actor in its history. Even in areas frequently identified with drone warfare, such as the Horn of Africa, Yemen, and Pakistan, non-drone US interference has occurred at varying levels of frequency during the War on Terror. As uncomfortable as it might make foreign policy commentators (sometimes myself included), the founders always recognized a difference between military operations involving sustained use of land forces and those involving a primarily maritime or over-the-horizon force. This distinction is quite evident in the American Constitution, which as any sea power booster will tell you, stipulates that while an army should only be raised temporarily, Congress must provide and maintain a navy. This distinction has carried throughout American history (Even in the case of the Posse Comitatus Act, only the US Army and Air Force are specifically excluded from intervening in domestic affairs. The United States Navy and Marine Corps are actually only excluded under an internal Department of Defense directive). The American imperative to keep sea lanes flowing freely and protect the sovereign rights of American vessels and citizens overseas has been a much stronger push for American military involvement than drones have been or ever will be. Daniel focuses on the use of UAVs in his article, and I am completely uninterested in UAVs. But his prose is on point concerning the use of military power throughout the nation’s history. More specifically concerning drones, the policy makers and strategists seem to be under the magical spell of the tech ninja warriors who believe that we can engage in push-button war and win. Drones were useful when engaging non-state actors who had little financing or technology. As we have seen recently with Iran, nominal technology can shoot drones out of the air. Pilots will always be needed to fly fighters, warriors will always need to put boots on the ground, and ships will always need to support troops closer than the 20 mile “beyond the horizon” that they want to avoid. 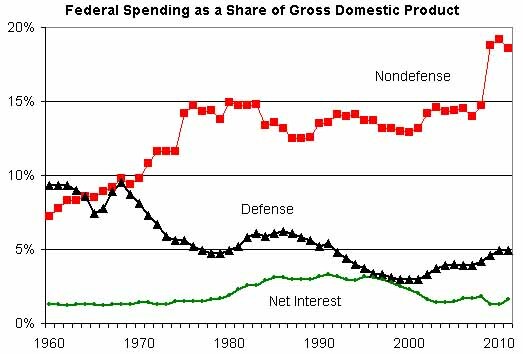 There is no answer to the costliness of war, and gutting defense spending to pay for entitlements won’t supply either with enough funding. The cost for war-making won’t go away, and the appetite for entitlements only grows with more spending like an obscene addiction. I have pointed out before that progressives have always wanted to make war differently, that they claim to support equality of the genders (in the face of biological evidence to the contrary), and that they claim to be neo-isolationist concerning the use of American military power. But progressives don’t tell you everything. They’re lying in most, if not all cases. This has always been true. It is true now, and we see that the size of special operations is going to increase while the size of the so-called general purpose forces will decrease by some 15%. In fact, they want virtual permanent deployment for some special operations. In response to requests from U.S. Central Command, which oversees military operations in the Middle East, the Navy is converting an aging warship it had planned to decommission into a makeshift staging base for the commandos. Unofficially dubbed a “mothership,” the floating base could accommodate smaller high-speed boats and helicopters commonly used by Navy SEALs, procurement documents show. Special Operations forces are a key part of the Obama administration’s strategy to make the military leaner and more agile as the Pentagon confronts at least $487 billion in spending cuts over the next decade. Lt. Cmdr. Mike Kafka, a spokesman for the Navy’s Fleet Forces Command, declined to elaborate on the floating base’s purpose or to say where, exactly, it will be deployed in the Middle East. Other Navy officials acknowledged that they were moving with unusual haste to complete the conversion and send the mothership to the region by early summer. They have even taken one of the assets of the U.S. Marine Corps, an amphibious assault dock. All the while, as the Marines continue to imagine that they will ever do a large scale, sea-based forcible entry again, they sink deeper into complete irrelevance in the twenty first century. Visions of Iwo Jima dance in the heads of Marine Corps planners, while the real fight – the one the Marines should be leading – goes to what has effectively become another (secretive) branch of the service, SOCOM. American history is replete with examples of warfighting without a formal declaration of war. But the main focus has usually been the U.S. Marine Corps. The strategic planners of the Marine Corps have lost their way, and continue to send Force Recon Marines into SOCOM rather than develop and enhance their own capabilities to conduct such operations. They have even retired the only remaining asset in their air fleet that is capable of inserting Marines by fast-roping. The V-22 cannot do that. But when the final story is told, we will not be safer for creating another branch of the service, or for gutting military spending in favor of the tech ninja paradigm. We will regret it. Marine Corps to Secretary Gates: We’re Relevant! The “Soldiers of the Sea” have been fighting on land for a decade in Iraq and Afghanistan.The Corps’ amphibious troop carrier has just been canceled; its new fighter jet was postponed. And the Marine Corps itself is finishing up its own review, asking this basic question: What should the Marine Corps look like in the 21st Century? The Marine Corps has made a name for itself storming beaches: Barbary Coast and Veracruz, Iwo Jima and Inchon. “For many years now, its core mission has been forcible entry, meaning going ashore in the face of hostile fire to claim enemy beaches and then push inland quickly before defenders regain their balance,” says defense analyst Loren Thompson. He says those days may be over. That’s because Defense Secretary Robert Gates has done something that pirates in the 19th century and Japanese troops in World War II couldn’t do — he has the Marine Corps reeling. Gates stopped the Marines from going ahead with their Joint Strike Fighter, a stealthy warplane. And he canceled the Marines’ amphibious troop carrier, known as the Expeditionary Fighting Vehicle or EFV. “The EFV, originally conceived during the Reagan administration, has already consumed more than $3 billion to develop, and will cost another $12 billion to build, all for a fleet with the capacity to put 4,000 troops ashore,” he said. That’s a lot of money to get a few thousand Marines on the beach. 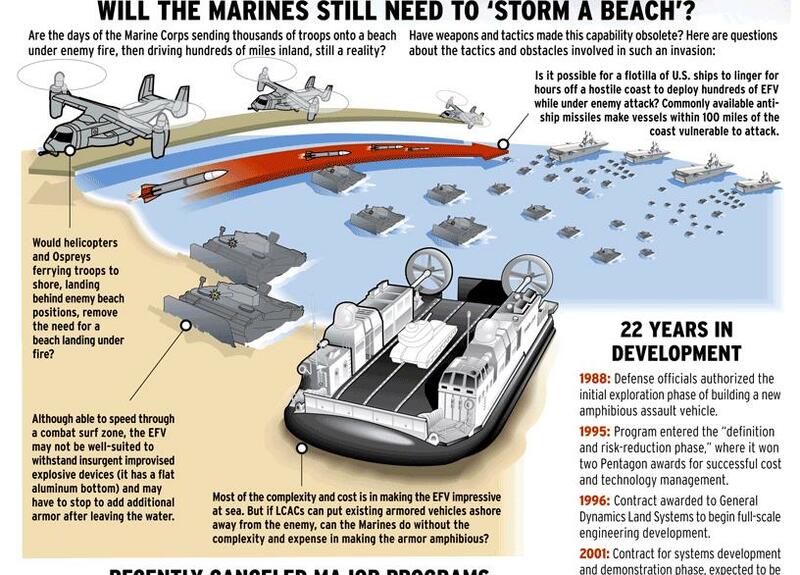 So the Marines will update their decades-old amphibious troop carrier instead. The cuts and delays to the Marine Corps’ budget are symbolic of a larger debate about the role of the Marine Corps in future warfare. Many potential adversaries have sophisticated long-range missiles that could strike the Marines in their landing craft long before they reach the shores. So Gates already has said it’s unlikely the Marines will be hitting the beaches like they did at Iwo Jima. And Thompson says that raises questions about the relevance of the Marines. “If the Marine Corps is no longer going to do opposed landing on enemy beaches in the face of hostile fire, then its role will be significantly diminished in the future,” he says. The Marines publicly dismiss talk they’re becoming less relevant, and say that attacking enemy beaches is just one of their jobs. Their senior officer, Gen. James Amos, said recently they’ve been busier than ever. “Since 9/11, U.S. amphibious forces have responded to crises and contingencies at least 50 times, a response rate more than double during the entire period of the Cold War,” Amos says. That includes everything, from Marines fighting Taliban fighters 10 years ago, to helping Pakistanis caught up in massive flooding last fall. The ability for Marines to float offshore and quickly respond offers any president a way to influence events, says retired Marine Gen. Chuck Krulak. “They can remain over the horizon, they can come on to the horizon and be seen and increase the pressure, or they can come ashore,” he says. And the Marines’ physical presence, Krulak argues, cannot be replaced by high-tech weapons. “A B-2 bomber flying at 60,000 feet is not present, it’s nothing more than contrails in the skies,” he says. The Marines may argue they’re irreplaceable. But Gates has suggested cutting their numbers — not just their weapons. Gates wants to reduce the Corps by some 15,000 to 20,000 in the coming years. Defense analyst Gordon Adams says that’s a higher proportion than the cuts Gates has called for in the Army. “My view would be that the Army deserves to be significantly cut rather than the Marine Corps,” Adams says. Adams worked on Pentagon budgets in the Clinton administration and thinks Gates’ cuts are ill conceived. “His decisions have by and large been driven largely by technology, costs and efficiency,” Adams says. But not by strategy, he adds. Adams says the Marines are more agile than the Army and cost less. They can handle a range of missions — everything from delivering humanitarian assistance to training foreign militaries to fighting insurgents. The Marines have no trouble speaking for themselves. In the coming weeks, they’ll outline to Gates why they’re still relevant. Regular readers know that I oppose humanitarian missions for the U.S. Marines. Not that I oppose humanitarian missions. I oppose humanitarian missions for the Marines. You don’t design and build the most effective and violent fighting force on earth and send it on humanitarian missions. That we have done that before in recent history is a sign that the Marines are looking for a mission. And the lack of opposed landing in the grand strategy doesn’t in the least diminish the relevance of the U.S. Marine Corps. Let me tell you what does diminish the relevance of the USMC. Reliance on gadgets, doohickeys and thing-a-ma-bobs. You know – electronically controlled, electrically powered crap that needs heavy generators which then need to be moved by massive flotillas to site by logistics engineers months in advance of operations in order to supply the necessary power – or, crap that needs high tech solar panels to operate in the field because massive generators can’t be moved there. Lack of ability to get water from their surroundings diminishes the relevance of the USMC. From backpacking, hiking and camping, I and each of my four children know how to purify water from our surroundings. I and each of my four children know how to climb and rappel. I and each of my four children know how to make decisions on the fly, not waiting on specific commands but relying on broad mission goals to guide our actions. And only one among my four children is a Marine. Long times to deploy troops diminishes the relevance of the USMC. Reliance on the future needs for large scale amphibious assault landings diminishes the relevance of the USMC. The overly expensive Expeditionary Fighting Vehicle diminishes the relevance of the USMC. Let me tell you what ensures the relevance of the USMC. Short notice deployments. Pressing responsibility and authority down in the chain of command. Making efficient and effective use of their surroundings. Distributed operations. And again, distributed operations, with reliance on chain of command pressed down in the organization. Training exercises to make sure that the USCM is still capable of forcible entry without long deployments of MEUs assuming that such entry will be called upon against a near peer state. Forcible entry based on another premise than AAV or EFV or LCACs, namely, air-based forcible entry and fast roping. Landing behind the beach head, securing land, and then allowing the Navy to transport heavy equipment while the Marines fight. Being called upon to secure people, free hostages, raid locations, kill enemy on short notice, and all other manner of short term operations, and being called upon to do this in lieu of SOCOM, and outside the SOCOM chain of command, which has now usurped the authority of the branch chains of command. Less reliance on Force Recon and SOF and SOCOM. Ensuring rifleman skills superior to those of the other branches. At one time in our history, the USMC was the branch capable of projecting power – large and small – on foreign shores at a moment’s notice. Now, SOCOM chain of command and SOF operators have taken this mantle. Admit it. It’s the truth. The USMC can pound their chest and train for large scale forcible entry, go on large nine months MEUs where there is no enemy to engage and where the President doesn’t call on them to conduct operations, and the USMC can become irrelevant. Or, the USMC can embrace a new vision, a vision other than that of 60-year-old large scale amphibious assault landings with water-borne craft susceptible to land-based rockets. It’s up to them. I think the Marines are more versatile and capable than the Army, and I choose the later. Let’s see what the Marines choose. They may be readying themselves for 21st century irrelevance. Will the USMC Become a Second Land Army? Will the U.S. Marine Corps Become A Second Land Army? The U.S. Marines are allegedly trying not to become a second land army by focusing on sea-based forcible entry via the EFV. But recall the view expressed here at TCJ? The Orange County Register shows it pictorially. Note the question at the left. “Would helicopters and Ospreys ferrying troops to shore, landing behind enemy beach positions, remove the need for a beach landing under fire?” Yes, we had better hope that it does. And I haven’t seen any advocate of this position except here at TCJ. But the hugely expensive and troublesome EFV and the concept of forcible entry under heavy fire is the only differentiating factor now in its vision and the Army’s vision. The return to the sea apparently requires the EFV according to current Marine Corps doctrine, and without it, the Marines are dead – or so we are told by the U.S. Marine Corps thinkers. In every other way the Marines are doing everything in their power to ensure that they become a second land army. Lose their rifleman skills? Sure. Start up some heretofore unneeded cyber command within the Marine Corps? Sure. Why the Marine Corps needs a cyber command is anyone’s guess. What these Marines are going to do is anyone’s guess, and they as much as say so. The balance of the branches have robotic stuff, so how about the Marines? Sure. After all, the Corps must stay up with the other branches, right? Where is the strategic and innovative thinking? Where are the original concepts? Where are the scholar-officers in the Corps? While the Corps turns to robotic mules, heavy equipment, cyber warfare and green power, and turns away from being able to get fresh water from their own environment when dropped into the battle space, the nation continues to turn more to special operations forces and the SOCOM chain of command to perform its expeditionary and irregular warfare. So be it. The stubbornness and lack of adaptability of the old and outdated Marine Corps vision will ensure its irrelevancy and expendability. Greg Grant writing at DefenseTech weighs in on a subject near to our hearts. As I read the news reports, and this post at Tom Rick’s blog on the future of the Marine Corps, I recalled a recent conversation with some department of the Navy types who expressed just how bad the relationship is between the sea services. Like most troubled relationships, the soured feelings revolve around money, or the lack thereof. The Marines want to maintain a robust amphibious assault, enough to lift two Marine Expeditionary Brigades, and get them ashore via their Expeditionary Fighting Vehicle (EFV) armored amphibian. The Navy wants capital ships and intends to cut maritime prepositioning force ships, possibly amphibs and the EFV. A real battle is brewing and it’s bound to get ugly as budget realities sink in. The long wars in Iraq and Afghanistan have turned the Marines into a much smaller and more poorly equipped version of the Army. Defense Secretary Robert Gates has made it clear he thinks the U.S. has too much amphibious assault insurance. Few defense watchers believe Marine numbers won’t come down in the near future; the question is will they go lower than the pre-2007 175,000 level. Robert Haddick makes the point that the Marines have made the obvious choice to lose around 27,000 Marines from the force in favor of pressing forward with the expensive EFV and the balance of its vision. They are apparently already resigned to it, and instead of saving the size of the Marines, leadership is sacrificing bodies on the altar of large scale amphibious assault landings against near-peer states, something I find remarkably creepy. I haven’t advocated against the idea of forcible entry capabilities, but rather, the specific version of it being pressed by current leadership. … the tactical capabilities of the EFV are not at issue. It’s the place that it occupies in the strategic plan. I still reject the Commandant’s dilemma, i.e., that we fund the EFV or the Marines become obsolete. This is the thinking of outdated, mid-20th century, South Pacific strategy, not that of the 21st century. The U.S. Marines will always be needed, but the paradigm must be retooled. It must be. All Marine Corps readers, listen to me, and listen to me well. I continue to pose the following questions to the strategic thinkers in the Marine Corps. Where are we going to invade? What country, or what failed state? What are the tactical capabilities of this country or failed state, and why do we need floating tanks? Does this state have shore to ship missiles? Have you thought much about a fighting vehicle that has all of the capabilities of the EFV (MK44 cannon, stabilized turret, etc.) but without the need for flotation? Why can’t troops come ashore via air delivery (e.g., fast-roping) rather than sitting in a floating tank? Sorry, I don’t buy it. Do better. And to date no one has explained to me why the Marine Corps needs this particular vision. But while Tom Ricks doesn’t weigh in with any particular view, one commenter has the right idea. Here is how the Corps can keep 40 amphibs. Cut MEU-ARG steaming days in half. The Navy thinks amphibs are surface combatants (they are run by SWOs) so they want to steam and maneuver for no real reason, which burns up billions in fuel. Deployed MEUs should sit in port most of the time, and just steam from port to port unless they are doing a landing. No more sailing in circles for fun. Cut amphib crews in half. Less time at sea allows cutting stuff like ship stores, barbers, ect. Use the bored Marines to pick up much of the load, like mess duty, helo refueling, and other stuff. Save the Navy manpower by merging the Navy Beach Groups with Marine Logistics groups. Scrap the three old Admiral pleasure ships, the ampib “command ships” that have no value. Get the failed V-22s off the ships and deploy with more CH-53s and UH-1s. The V-22s are destroying the decks with their engine heat, the Navy has complained, but the Marines don’t care. Same problem with the F-35 JSF, cancel that turd. Buy practical FA-18Fs instead. Commenters (such as at Ricks’ blog) and bloggers (me) are making more sense than the Marine Corps leadership at the present. I don’t like the push to save money at the expense of the military, but this is about more than money. We ought to be spending it on the right things. I am still not convinced that we are. The Orange County Register has an interesting article on the next U.S. Marine Corps installment of their defense of the Expeditionary Fighting Vehicle (EFV). CAMP PENDLETON – On a cool day in late June, the Marines asked local media to board this seaside base and learn more about a new 80,000-pound hulking war machine – the Expeditionary Fighting Vehicle or EFV. They handed out information packets with glossy brochures, touting the $16.7 million amphibious machine as far more lethal, agile and sophisticated than the current assault vehicle, now nearly 40 years in service. It was a polished presentation and the Marine Corps will need its best sales pitch with prototypes currently being tested. In a tough economy, the Corps is trying to sell the beast of a vehicle, first to the American people, and second, to members of Congress, who ultimately will write the check for it. The price tag is steep: $13 billion for the entire program with detractors already having put the fighting machine in the crosshairs. And, immersed in land-locked battles in Iraq and Afghanistan, the Marine Corps itself stands at a crossroads. If approved, the hulking ship-to-shore vehicle would solidify the amphibious future of the Corps. If rejected, it raises the question: Will the Marines be rendered another land army? Indeed. Has the OCR been reading The Captain’s Journal? It isn’t that I don’t see the tactical value of the EFV. Clearly, I do. It’s that I don’t yet see the strategic value of the EFV, and that I have recommended a different paradigm. The EFV is designed for a near peer state (or close to it), and its presupposition is active enemy fire while ferrying troops ashore while providing covering fire. It is a reversion to 65-year old amphibious warfare doctrine with updated equipment. But if the state upon which we intend to conduct forcible entry is capable of rocket fire against navy vessels (positioned 25 miles offshore over the horizon in order to increase the likelihood of survival), the EFVs will become deadly transport vehicles for Marines. If the nation-state is in fact not capable of such opposing fire, then the EFV is not needed. But the tactical capabilities of the EFV are not at issue. It’s the place that it occupies in the strategic plan. I still reject the Commandant’s dilemma, i.e., that we fund the EFV or the Marines become obsolete. This is the thinking of outdated, mid-20th century, South Pacific strategy, not that of the 21st century. The U.S. Marines will always be needed, but the paradigm must be retooled. It must be. All Marine Corps readers, listen to me, and listen to me well. The U.S. Marine Corps is retooling itself after years of land battle in Iraq and Afghanistan. They want to go back to their sea-based roots with the Navy. Undersecretary Bob Work has made a case for more capability in distributed operations, a lighter expeditionary unit, strong coupling with the Navy, and the continuing viability of forcible entry based on amphibious capabilities. I have been a staunch defender of the military in light of demand for budgetary cuts. In light of the difficulties associated with startup of the shipbuilding industry in America again, I have advocated staying the course. There are many admirable aspects of Bob Work’s vision such as distributed operations (a strength long ago recognized and given legitimacy in the Small Wars Manual), and there is truth to the notion that forcible entry is not a dead concept. It will be employed in the future in the interest of national security. This is as safe a bet as any that can be made. In an anti-access environment where the enemy has a capable battle network capable of firing salvos of guided weapons, the initial phase of any theater entry operation will require achieving air, sea, undersea, and overall battle network superiority. This will mean this type of operation will be deliberate and take some time to develop. This does not mean “damn the G-RAMM, full speed ahead.” It means, “take your time, roll the G-RAMM threat back, and then land at a time and place of your own choosing.” No 10-day landings in this environment. Once ashore, the primary threat to the lodgment will come from G-RAMM “counter-attacks” and hybrid warriors who most likely will hide amongst the people. This will require the Marines to concentrate on establishing an inner G-RAMM perimeter designed to keep guided rockets, mortars, and artillery suppressed/out of range. The joint force, especially the defending Navy battle network, will concentrate on defeating the longer range-G-RAMM threat. This response, interesting and important though it is, lays the paradox out for us in all of its color. “Roll the G-RAMM threat back … land at a time and place of your own choosing … establishing an inner G-RAMM perimeter designed to keep guided rockets, mortars, and artillery suppressed/out of range.” Forcible entry under heavy fires from combined arms is either in the plans or it is not. If it is in the plans, then the EFV is designed to be used against a near peer or sizable nation-state with a uniformed army and capable of such a defense. This is unfathomable. Use of a couple of BLTs and supporting equipment is not nearly enough to effect success under these circumstances. The mission would be suicidal. It’s unfathomable precisely because we’re smarter than that. If on the other hand the location upon which we intend to do forcible entry is not a developed nation-state capable of employing such combined arms, then the EFV is not necessary, and may even be an impediment to efficient operations give its amphibious-based design. Large scale amphibious assaults against near peer states or secondary powers are not likely, and history may have recorded the last such assaults more than 50 years ago. The EFV, designed for an assault that isn’t likely to happen, is a vehicle in search of a mission. On the other hand, there is virtue in becoming lighter. While also defending the Osprey V-22, I have argued strongly against retiring the helicopter fleet, and also for development of a new, more capable Marine Corps helicopter fleet (a wiser expenditure of money than the EFV). While some have speculated that the Phrog is finished, I have argued that it is capable of delivery of Marines by fast-roping, something the V-22 can’t handle, and thus it should be maintained and even upgraded if necessary. A lighter Marine Corps should be coupled with a faster moving Marine Corps, one that won’t have to lumber on shore in heavy vehicles. Helicopter delivery of Marines inland to secure the perimeter in situations of hybrid warfare, while relying on the Navy to deliver the heavier equipment later if it is deemed that it is needed, would support both a retooled Marine Corps and the needs of the 21st century. The current Marine Corps vision tries to do it all. Consequently, the President and Congress are having to rely more heavily than ever on Special Operations Forces to do the role of rapid response and deployment, forcible entry of small teams conducting distributed operations, interdiction, and mission support where the most valuable commodity is ease of ingress and egress, lightness, and mission-specific tooling and weapons employment. This is a role that the Marine Corps should be filling. The vision obviously has had a great deal of work put into it, but it suffers from being all things to all people under all circumstances. The Marine Corps cannot accomplish miracles. But it can be the best at the mission given to it. The need of the hour is for clarity and focus of the mission statement.